It has been a crazy month and I have been on my toes. We moved to a new place and that explains why I haven’t posted in a while. 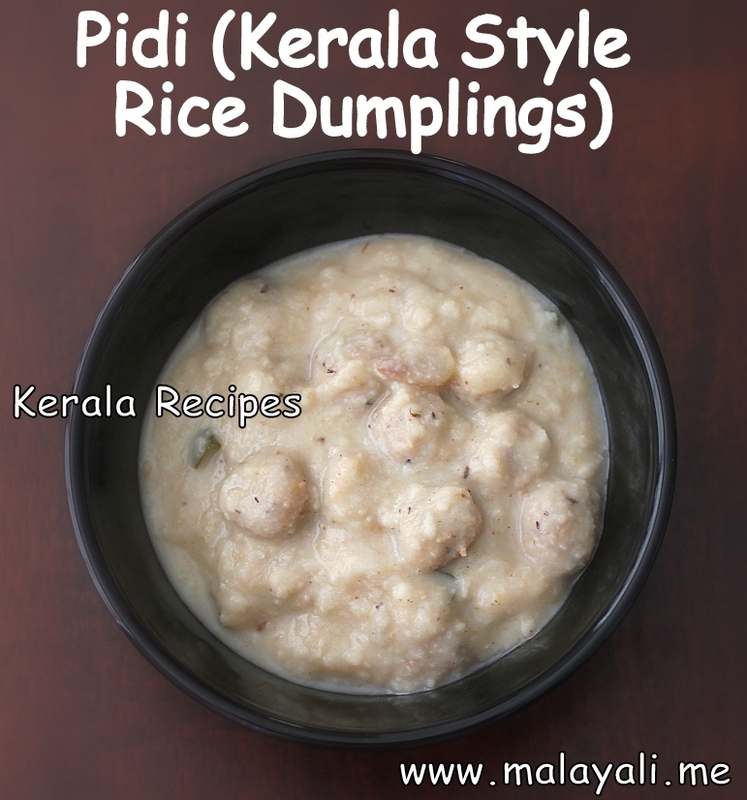 Without much ado, I am sharing with you my aunt’s recipe for Pidi (Kerala Style Rice Dumplings). 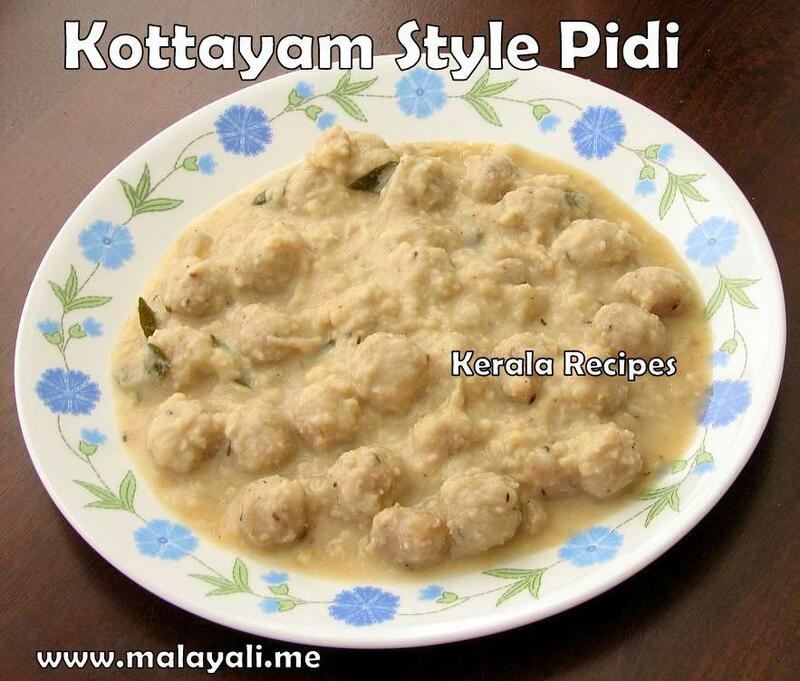 This is the authentic recipe for Kottayam Style Pidi which is a part of the traditional Knanaya Cuisine. These rice dumplings have a thick sauce unlike some dry versions of Pidi Kozhukutta. Pidi is almost always served with Chicken Curry. Pidi is a must for certain occasions like when an expectant daughter-in-law is sent to her parents’ home during her seventh month, Pidi is served with Chicken Curry for all the guests. All the ladies of a house gather around the table to roll these dumplings as it is time-consuming when done alone. Pidi is made with either Roasted Rice Flour or Avalos Podi. The rice flour used is often derived from Kerala Rosematta Rice/Red Rice (Nellu Kuthari). You can also use store-bought Rice Flour though the taste wouldn’t be the best. Pidi is one dish which takes several attempts to master. It requires some amount of trial and error before you learn to make the Perfect Pidi. For a sweeter version of Pidi, check out the recipe for Paal Pidi. Fill a deep pan with around 15-16 cups of water. Add shallots, curry leaves, grated coconut, crushed coriander and salt to taste. Bring everything to a boil. When the water comes to a rolling boil, transfer 6 to 7 cups of water to another pan for making the rice dumplings. Switch off the stove and keep the remaining water covered. In another pan, add little salt and mix the avalos podi and 1 cup rice flour. Slowly, add hot water to the avalos podi and rice flour and combine with a spatula. When the heat is manageable, slowly knead everything with your hands to form a soft and smooth dough. If the dough is dry, the dumplings will break. So you will need to add more water. If the dough is sticky, you will need to add more rice flour. Using your palms, start making small cherry sized balls with the dough. Dip you hands occasionally in warm water while rolling the dumplings to prevent it from drying out. Place the dumplings on a plate and sprinkle little rice flour to prevent the balls from sticking. Once all the dumplings have been prepared, again bring the remaining water in the first pan to a rolling boil. Slowly, add the dumplings to the boiling water. The water should be boiling or else the dumplings will break. Do not stir the dumplings. Allow it to cook. When the mixture begins to boil again, gently stir the dumplings. Reduce heat and simmer the dumplings for around ten minutes, stirring occasionally. To thicken the mixture, combine grated cumin and 2 tbsp rice flour in 1/2 cup of water and add it to the pan. Stir gently for a few minutes. When the mixture has thickened, add 1/2 cup of coconut milk. This will enhance the taste but is optional. Stir and remove from heat. Serve immediately with Chicken Curry. The water required for preparing the dumplings will vary depending on the rice flour used. You can use Avalos Podi and Rice Flour in any proportion for making Pidi. If you don’t have Avalos Podi, you can make it with Roasted Rice Flour or Puttu Podi. If you are using only Rice flour, make sure you add an extra cup of grated coconut and an extra teaspoon of cumin while boiling the water. What can I say! You are really talented. Thank you for sharing traditional Kerala Recipes so that Mallus all over the world can try these dishes in their kitchen. Expecting more Kerala recipes..